Mister M & One87 started out 10 years ago, with a very simple concept, which was creating a top quality Drum’n’bass event, and look where they’re now ! Star Warz blew up to one of the finest Drum ‘n’ bass concepts the world has ever seen, this due to top quality line ups, great artwork, a top class venue and a heavyweight soundsystem. The world’s greatest Drum’n’bass artists passed the revue, such as Andy C, Goldie, Noisia, Friction, Marcus Intalex, and many more…but also names such as Icicle, Alix Perez, Commix, Jubei and Klute contributed a great deal to all this. And off course we don’t forget the mc’s, such as SP:MC, Stamina and Rage, who’ve been hyping up the Star Warz crowd every time … over and over again. Obviously we won’t forget our very own Belgian Drum’n’bass artists who have been supporting these line ups every time. Dj’s Such as Wontime, System D, Murdock and resident One87 also contributed a great deal to the success of Star Warz. Yes, we can look back at the past 10 years and be very proud… very very proud ! Off course this wouldn’t been possible without you, the Belgian Drum’n’bass crowd, so a BIG thank you goes out to all of you for the firm support we got from you every time again ! 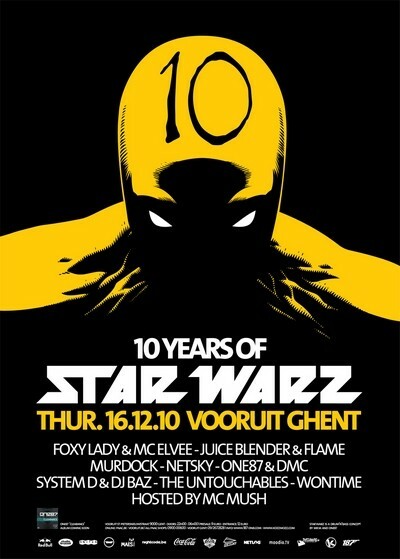 So now, coming up, Star Warz ‘10th Anniversary’ edition, and what better way to celibrate this than by doing an all Belgian line up, and this for only 9€ for a presale ticket ! Yes we wanted to give something back, as a ‘thank you’ for the great support we have been receiving from you. Beware of this cool line up who will definitely rock you ! As headliner we have the almighty ‘Netsky’, who’s currently taking on the world with his partylike productions and dj sets. He was also voted best Belgian dj on Studio Brussels. Prepare for some serious partying here ! Who also needs no introduction is One87, who has been Star Warz’ resident for 10 years now ! Look out for his cutting edge set he will bring this edition, backed up by his trusty mc ‘DMC’. Next up is Wontime, an old school legend in this country, representing Leuven, and who has proven to be one of the sharpest dj’s around. And off course we can’t miss out on System D, also a legend in Belgium, who’ll do a back to back with his mate ‘DJ Baz’ from Liege. All these artists will be backed up by The Untouchables, Juice Blender & Flame and Foxy Lady & Mc Elvee. Host for the night is no one less then Mc Mush, Belgians finest mc, without a doubt. Make sure you don’t miss out on this legendary night, because it will go down in Drum’n’bass history ! You wanted Drum’n’bass? We give it to you !